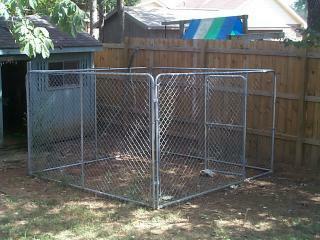 My coop and run started with a 10x10x6 chain link dog kennel, found on Craigslist for $100. 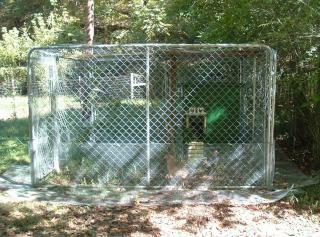 On left the kennel as I found it; on right the kennel with wire cover, hardware cloth apron, and original small henhouse. Initially I used a tarp over the top to keep rain out, but after a while, water collecting in the tarp tore the wire roof and I had to find another way. This is a closeup of the hardware cloth apron before it was staked down. 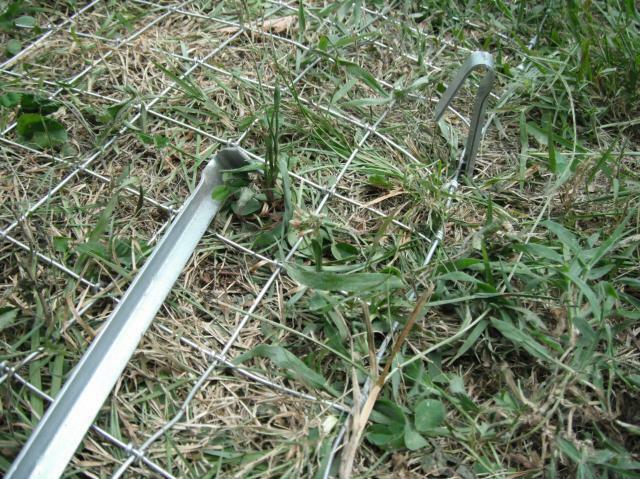 It is attached to the fence with wire and staked into the ground with heavy tent stakes. It's now mostly invisible-covered with dirt, grass, etc. Nothing has ever dug in (and I have seen no evidence of anyone trying to). Other than gophers, that is, LOL. 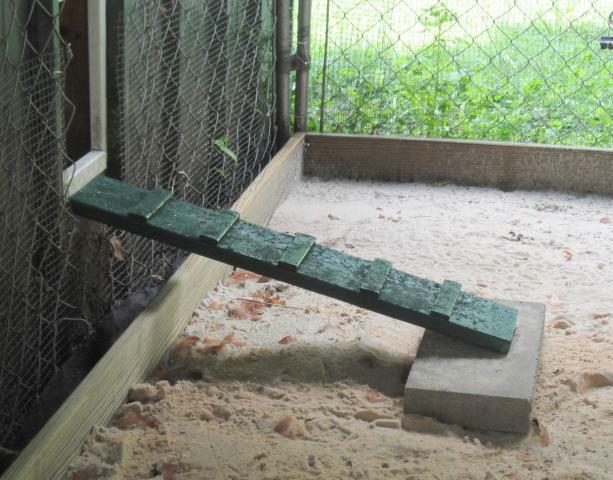 The building had a "loft" inside when it came to me--once I removed the piece of plywood over the 2 crossbeams, they became excellent, high roosts which the hens love. 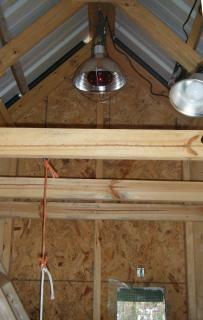 I added a heat lamp for cold winter nights and a ladder so they can access the top roosts. 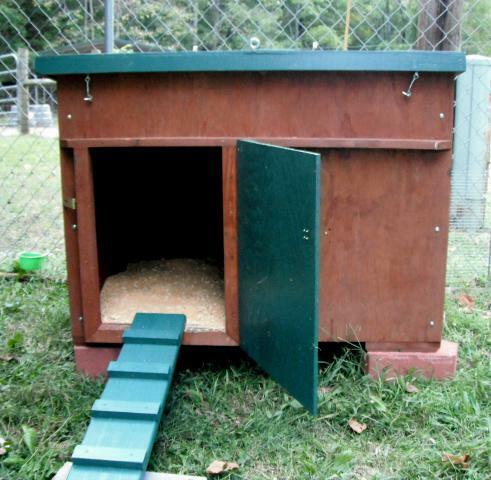 The little windows, with drop-down plastic covers, were originally for the hunters to stick their guns out of. I added hardware cloth, so that in wintertime the windows are closed, but in summer they can be opened for added ventilation. 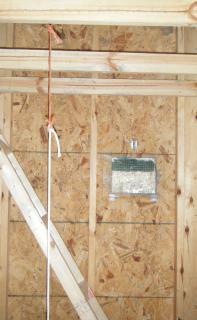 There is ventilation year-round via small gaps in the eaves. 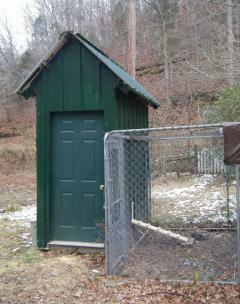 I made a door in the side of the house, leading into the kennel, which allows the girls to come and go. 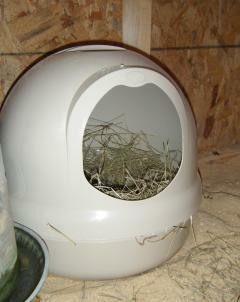 They use a rounded covered cat litter box for their nest box, which they all seem to love. The ramp was sprinkled with sand when the first coat was wet, then painted over again. The sand provides traction. I recently added in some additional perches to the run. 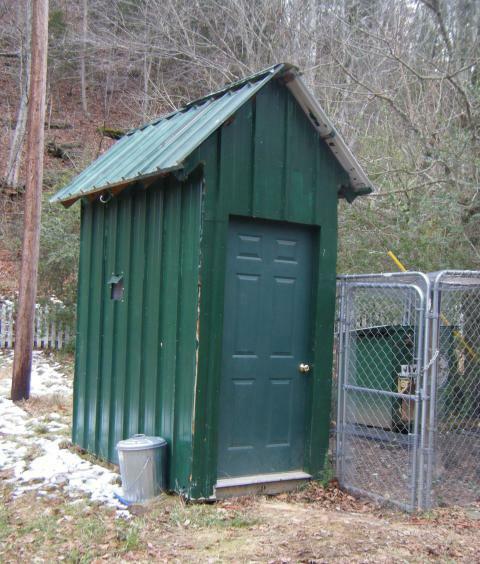 One is made from a 2x4 and 2 concrete blocks; the others are 2x4s mounted on the central 4x4 roof support. 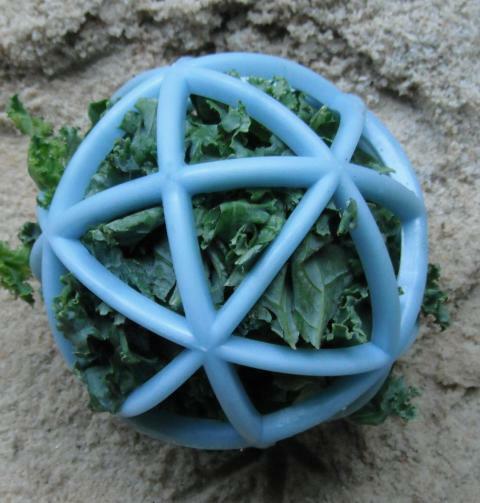 The girls get layer pellets, but they also get treats in the form of greens or weeds stuffed into one of 2 wire toys. This gives them something to do and keeps them busy. 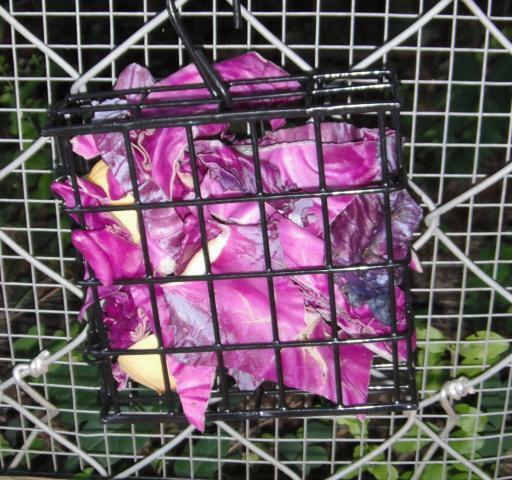 The ball is a cat toy; the wire cage is meant for feeding suet to wild birds. 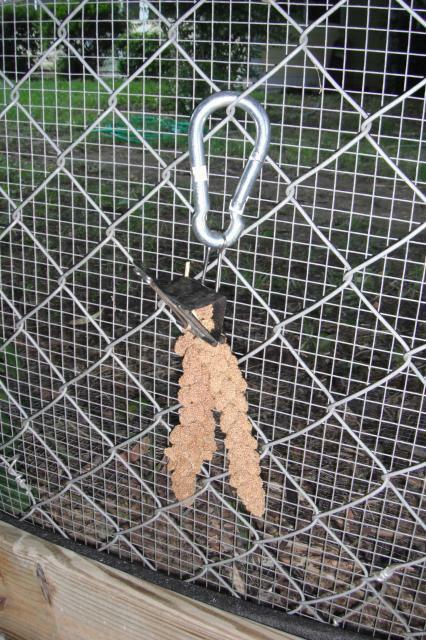 I hang millet sprays (you can get those at pet stores) from binder clips attached to the pen walls. 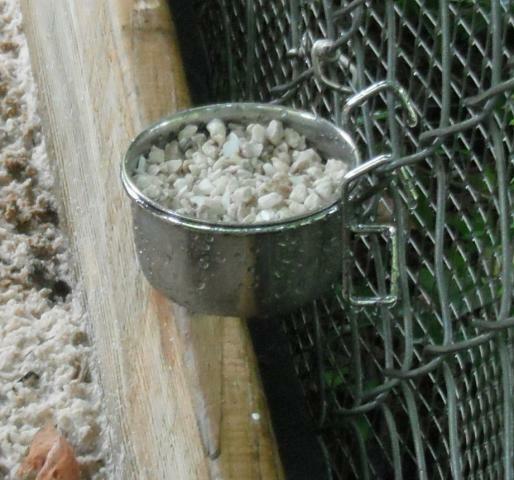 Their oyster shell and grit are in separate small cage cups. I recently added a second pen to the first. Again, I found it on Craigslist, this time for $90.00. I removed one panel of the existing pen (the one farthest from the camera in the pic above) and replaced it with the panel containing the door from the new pen. I then added the other panels. 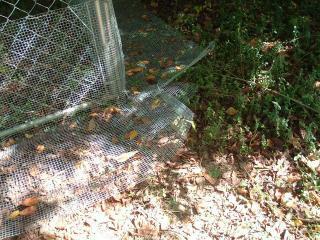 As with the first pen, I covered the pen with woven wire fencing, 2" x 2." I also made the anti-digging apron (staked in) out of the same woven wire material, as it's even stronger than hardware cloth (see pics below). 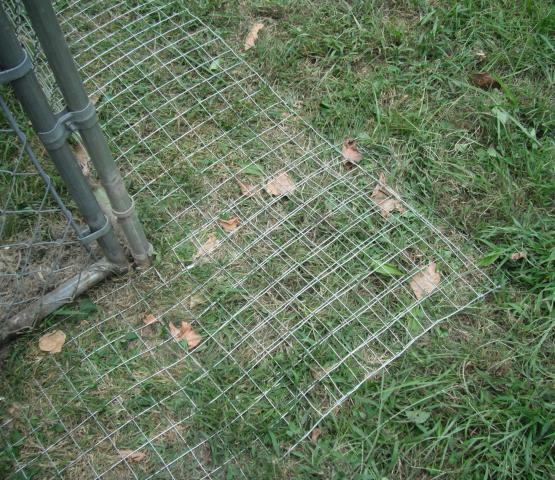 The bottom 2 feet of the pen have hardware cloth wired on to prevent raccoon attacks. 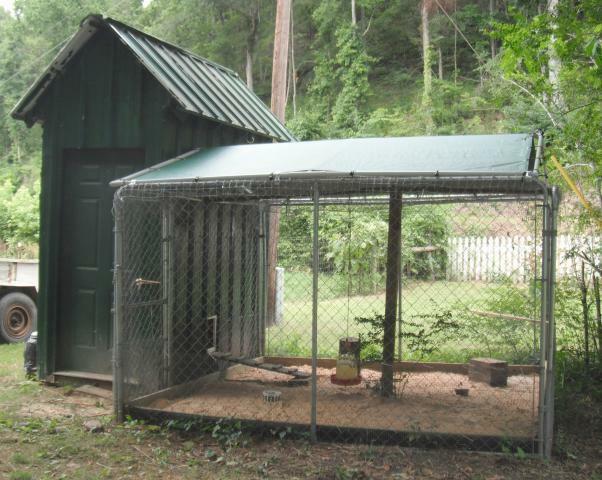 While my 2 new chickens, Audrey and Bianco, were living separately in the new pen (with Clarice and Svetlana in the original one), Audrey and Bianco used as a coop a dog house I re-purposed into the Mini Cooper. 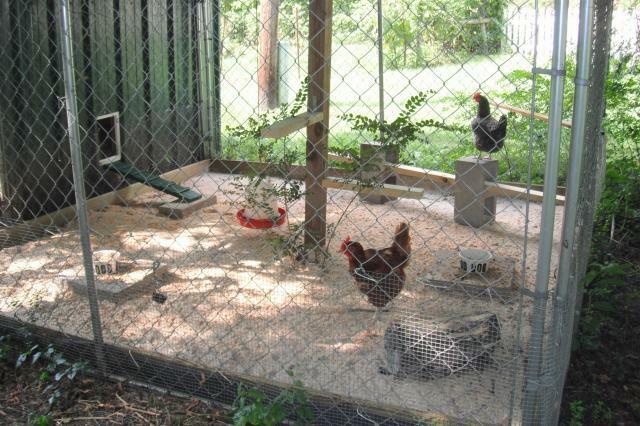 Once the Young 'Uns were integrated with the Oldsters, I opened the door in the panel between the two runs, so the 4 chickens have a 10x20 run area. I have not yet added sand to the new run. 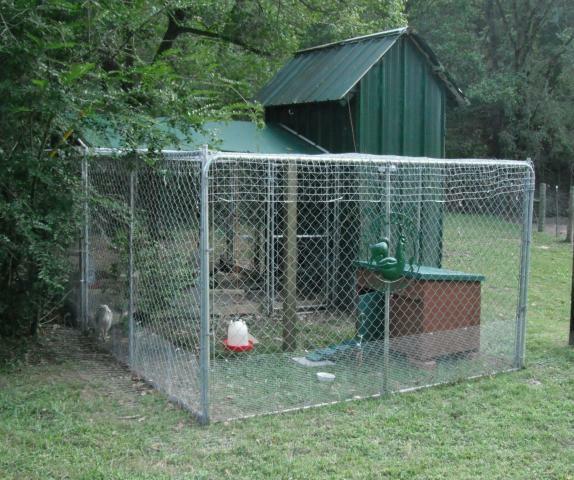 My original plan was to see if I could keep grass there by limiting the chickens' access to that run, but since Bianca turned out to be BiancO, I've decided that they all need as much room as possible to avoid problems once his hormones kick in. I will probably add gravel and sand to the new run as I did to the old run next Spring. I probably will NOT add a tarped pitched roof--I think it will be nice for them to have a way to get direct sunlight if they choose. 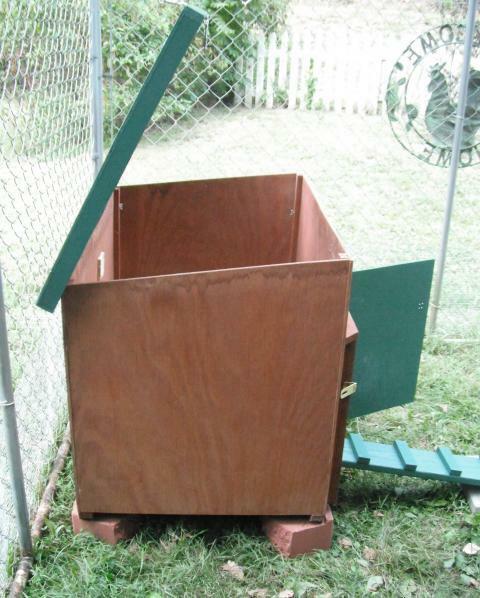 I believe your text and pix give sufficient detail for someone to build this type setup from scratch or follow suit and re-purpose things to get to the same goals. 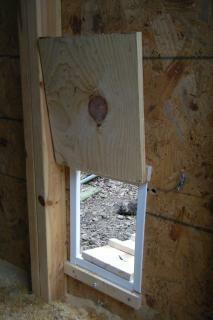 I would like to see more detail on how you attached and supported your roof over the runs. I love your toys! I may have to borrow some of those great ideas. i like the hardware cloth idea ..never thought about that ..awesome ..great set-up!